Anyone wondering what was happening with the Phase 2 announcement, might have looked for clarity with one of the Transport questions asked by David Mowat, MP for Warrington South, in Parliament yesterday: “What progress the Government have made on finalising the route for phase two High Speed 2”. Of course, they’ve made plans for announcements before: the phase 2 route itself was supposed to have been announced last year. However in a follow-up question Maggie Throup (Erewash) asked Goodwill to meet her and a delegation from Erewash Borough Council to discuss mitigation for HS2 on local residents and businesses, especially in and around Long Eaton. Goodwill emphasised that the route itself has not been finalised: its not just the timing of any announcements. Rumours are that HS2 phase from Fradley to Crewe (so called Phase 2a) will be announced during the Chancellors forthcoming Autumn Statement, due on 25th November. 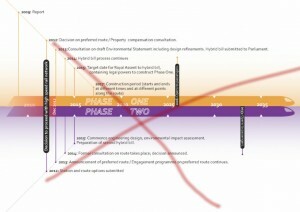 Further rumours are that phase 2 to Manchester (Phase2) will NOT be announced until late 2016. And with confirmation from Goodwill yesterday that the eastern side is not finalised, its clear that there are big problems with the route. It’s known that there are geotechnical problems of getting it across the Cheshire Salt Plain and similar problems across the former coal mining areas on the eastern leg of Phase 2. However, there are also the issues of the costs: the Chancellor is apparently going to announce £100 billion investments in the autumn statement. But unless you stick with the Government’s figure for HS2 of £50billion (in 2011 figures), and ignore such things as the current estimate of the Great Western Railway electrification (now £2.8billion) being three times originally planned, HS2 alone would easily swallow up the majority of that budget. Another factor is the locating of station sites, which may affect the political support from different councils in the areas.